My dad would probably not mind if I brought up the fact that he doesn't really know how to cook. That being said there are a few items he knows how to make. He is quite adept at making grilled cheese sandwiches though I'm not sure he's made one in the past ten years. One culinary invention that my father did introduce me to was the proper way to eat canned sardines. I know what you're thinking. You're thinking, "There's a proper way to eat canned sardines?" No? You're not thinking that? Oh, you must be thinking, "Ew, canned sardines, gross!" Well, to hell with you. I think they're delicious. 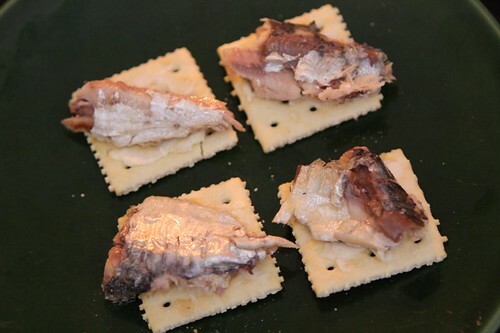 My father showed me that you spread a little butter on a saltine cracker, top it with a sardine, and put it away. It's quite delicious. I only made four of these because I wanted four and Jen wanted zero. 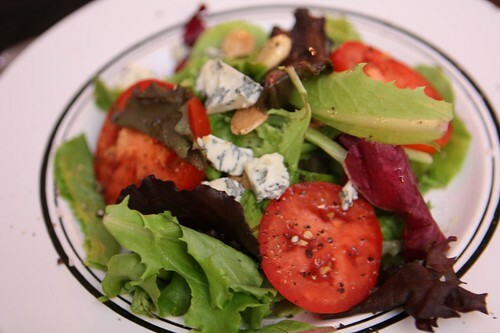 After the sardines I made some salads with baby greens, Marcona almonds, and this Bayley Hazen Blue cheese from Jasper Hill. Jen cringed at the thought of turkey soup last night but I was ale to convince her that tonight was the night. I cooked down some garlic, onion, and celery root then I tossed in some of the roasted butternut squash, carrot, sweet potato, delicata squash, pumpkin, acorn squash, turnip, and rutabaga. 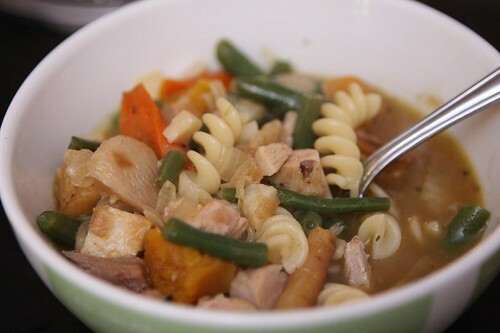 I also threw in some of the green beans that we never ended up using for Canadian Thanksgiving, then threw in some chopped turkey and leftover pasta. 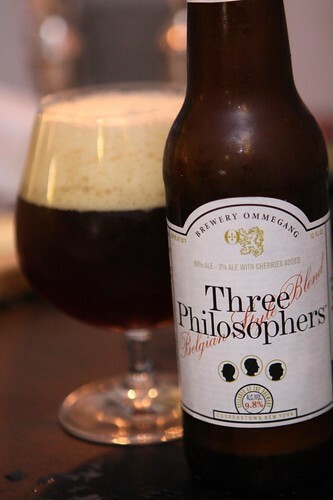 Since I generally am against the idea of having beer with soup I saved this Three Philosophers from Brewery Ommegang and enjoyed it as a dessert beverage. At 9.8% ABV one was enough. More than enough actually. It's that time of year where it's quite cold out but our building hasn't actually turned the heat on yet so a strong Belgian-style ale was just what I needed to stay warm. All Jen needed was one sip and a little Northern Exposure. That episode where Walt thinks he saw a caribou really warms you up. That's how Adam eats sardines too, if he can keep the cats from stealing them. It seems that a lot of people eat sardines this way. It's a taste sensation that has swept the nation. My father also ate sardines that way, though he prefered kippers to sardines.With pickled onions.